Easily the busiest of the tourism hotspots, West End Village is a mini-metropolis of accommodation, restaurants, bars, lounges, scuba shops and souvenir/artist emporiums. Half the town is fronted by Half Moon Bay, a perfectly crescent-shaped, palm-lined beach; the launching pad for West End wall and it colorful marine life. 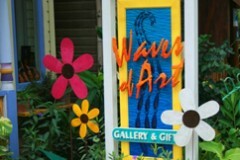 The Bay Island's premier giftshop and gallery of arts and crafts located in the heart of downtown West End Village.